In the last week I had the opportunity to provide an introduction to peer coaching to secondary teachers in North Dakota and Istanbul, Turkey. 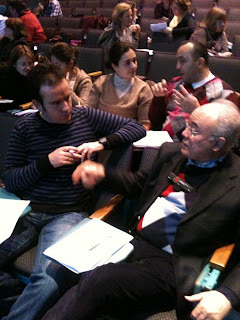 The sessions included defining peer coaching, identifying the costs and payoffs to teachers, modeling pre-conferences, having participants conduct pre-conferences with a colleague and modeling an entire coaching cycle with a teacher’s lesson on video. Talk to almost any teacher staff developer and they will often “joke” about how difficult, “not expecting anything of value,” high school staffs can be. Often the principal or central office person organizing my presentation will mention an upfront “warning “ so as to have me limit my expectations regarding the openness my message will receive. I have not found that to be the case as high school and middle school teachers examine and experiment with peer coaching opportunities. I explored this in an earlier blog a few years back. Here are some of the discoveries teachers shared this week as they experienced an initial coaching conversation with a colleague. My colleague is interesting – This statement generally, followed by audience laughter, was often shared with great sincerity. After listening to another teacher share the “thinking” behind an upcoming lesson, teachers saw each other in a new light. Due to my random assignment of coaching roles in the training, a first year teacher ended up as the coach to a 27 year veteran. As we debriefed, the first year teacher, beaming with excitement, found “ a statement I shared while being the coach had the veteran teacher recall a strategy she had previously used but had overlooked as a solution to her problem.” The veteran thanking the “newbee” created the opportunity for a collegial, risk taking peer culture at that school. I can’t wait to get back to my classroom and try what I just uncovered- That was the statement made by the teacher who pre-conferenced , shared a video clip from her classroom, and post conferenced in front of 50 colleagues. Michael Fullan identifies social capital as a key driver for successful school reform. Anthony Armstrong reports: One of those keys is using social capital to build collaborative cultures that foster individual development Social capital resides not in individuals but in the relationships among them and how those relationships allow for the exchange of expertise and support. Fullan argues that allowing all teachers to engage in daily peer-to-peer collaboration empowers them to take ownership of their profession and ongoing, continuous instructional improvement. Teacher professional development should equally focus on developing collegiality among teachers. What does “social capital” mean? The central premise of social capital is that social networks have value. Social capital refers to the collective value of all “social networks” [who people know] and the inclinations that arise from these networks to do things for each other [“norms of reciprocity”]. How does social capital work? The term social capital emphasizes not just warm and cuddly feelings, but a wide variety of quite specific benefits that flow from the trust, reciprocity, information, and cooperation associated with social networks. Social capital creates value for the people who are connected and – at least sometimes – for bystanders as well. In school those bystanders are the students that teachers serve. I like your concepts about coaching and enjoyed the PowerPoint. I prefer to speak about pre and post conversations rather than conferences. Conversation is more inviting and opens up the opportunity to develop trusting relationships. Too many teachers associate pre and post conferences with supervision and evaluation rather than coaching. As an educator, I’ve always valued learning together. When I read the comments you shared in your blog and from my own experiences I totally agree that coaching contributes a lot to collegiality and team work. About conferences vs conversations, I’d like to say that pre and post conferences concept is culturally adapted as “conversations” in Turkish. I agree with the fact that it can be more inviting. (Thanks to Michael for bringing this up) I believe that it is also important how you model it to teachers. Before starting actual coaching sessions all parts should have a common understanding about the whole process. otherwise even if we change the words, the actual experience will determine the perception and eventually the success of the coaching experience. Thanks Michael and Esra,,, right on…. vocbaulary can influence initial perception, experience can set a culture.